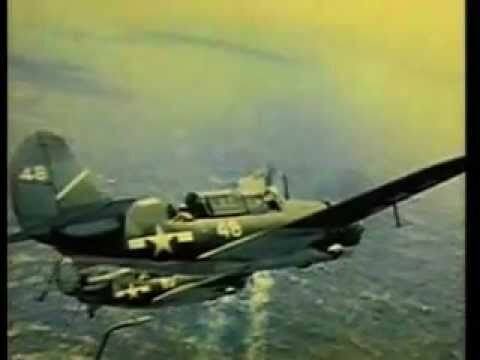 The Battle of Tinian was a battle of the Pacific campaign of World War II, fought on the island of Tinian in the Mariana Islands from 24 July 1944 to 1 August 1944. 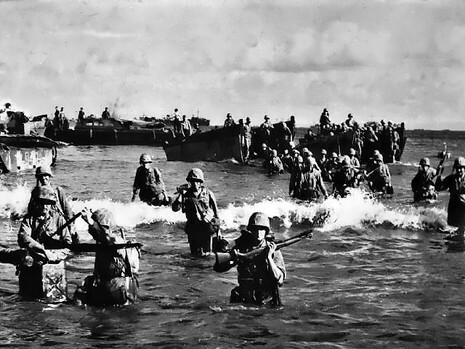 The American victory in the Battle of Saipan made Tinian, 5.6 kilometres (3.5 mi) south of Saipan, the next step in the Marianas campaign. The Japanese defending the island were commanded by Colonel Kiyochi Ogata. The 2nd and 4th Marine Divisions landed on 24 July 1944, supported by naval bombardment and artillery firing across the strait from Saipan. 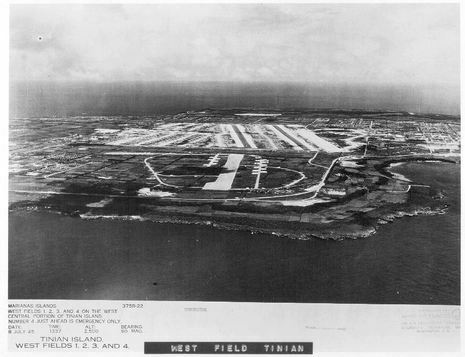 A successful feint for the major settlement of Tinian Town diverted defenders from the actual landing site on the north of the island. The USS Colorado and the destroyer USS Norman Scott were both hit by six inch Japanese shore batteries. The Colorado was hit 22 times, killing 44 men. The Norman Scott was hit six times, killing the captain, Seymore Owens, and 22 of his shipmates. The Japanese adopted the same stubborn defensive tactics as on Saipan, retreating during the day and attacking at night. 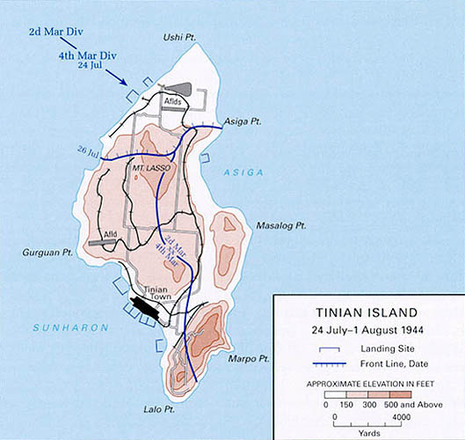 The gentler terrain of Tinian allowed the attackers more effective use of tanks and artillery than in the mountains of Saipan, and the island was secured in nine days of fighting. On July 31, the surviving Japanese launched a suicide charge. The battle had the first use of napalm in the Pacific. Of the 120 jettisonable tanks dropped during the operation, 25 contained the napalm mixture and the remainder an oil-gasoline mixture. Of the entire number, only 14 were duds, and eight of these were set afire by subsequent strafing runs. Carried by P-47 Thunderbolts, the "fire bombs", also known as napalm bombs, burned away foliage concealing enemy installations. US forces land on Tinian and face Japanese troops, 6.000 men. Early skirmishes are seen off but with considerable losses. Napalm is used for the first time in the Pacific theatre.